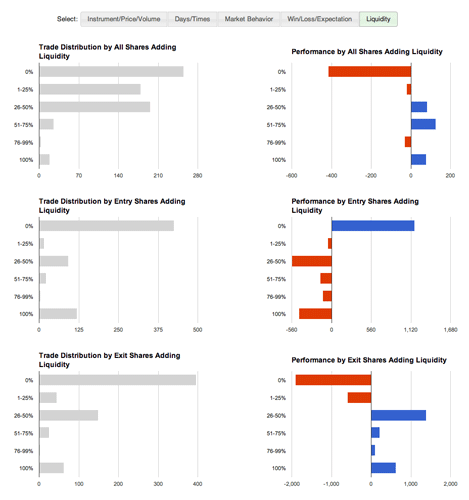 Tradervue supports detailed analytics of adding/removing liquidity for active traders. This shows you distribution and aggregate or average P&L performance, grouped by how many shares in the trade added liquidity. 0% means you took liquidity on all executions in the trade, and 100% means you added liquidity on all executions. 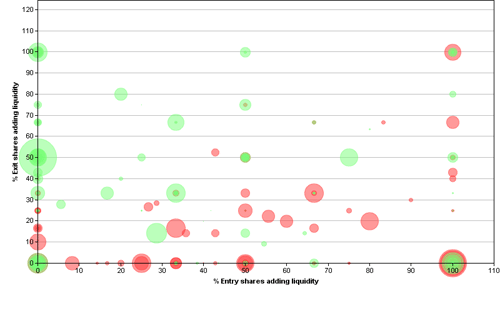 This shows you distribution and aggregate or average P&L performance, grouped by how many entry shares in the trade added liquidity. "Entry Shares" means all shares on the same side as the opening execution; so for example, for a trade to the long side, all buys would be "entry" shares, and all sells would be "exit" shares. This shows you distribution and aggregate or average P&L performance, grouped by how many exit shares in the trade added liquidity. "Exit Shares" means all shares on the opposite side from the opening execution; so for example, for a trade to the long side, all buys would be "entry" shares, and all sells would be "exit" shares. In this report, the X axis (from 0 to 100%) is the percentage of entry shares in a trade where you added liquidity; the Y axis is the percentage of exit shares where you added liquidity. So trades towards the lower left mostly took liquidity on both entry and exit, and trades towards the upper right mostly added liquidity on both entry and exit. Green circles represent trades with positive P&L, and red circles are trades with negative P&L. The size of the circle is the relative amount of the P&L, where the largest circles are the biggest winners and biggest losers. There are two basic requirements for the liquidity reports. First, your broker or platform must include the necessary data; in particular, we interpret the ECN fees to calculate adding/removing liquidity. Refer to our supported brokers/platforms chart to see which brokers and platforms support this. And second, because these reports rely on fee data, they require a Gold subscription to Tradervue. NOTE: For these reports, Tradervue assumes you are executing at an ECN that charges you a fee for removing liquidity, and rebates you back a credit for adding liquidity. The majority of ECNs in use by active traders behave this way; however, if you do a significant amount of your trading volume at a venue that does not work this way, then these liquidity reports will not be accurate.